Ferdie's Funhouse: The Happiest Place On Earth! I felt the need to post today to give thanks where thanks is deserved--thank you Walt Disney! On July 17, 1955, 53 yrs ago today, this glorious man brought to life the only place other than my parents' house that I get homesick for, DISNEYLAND! Quoting from Walt Disney himself, "Disneyland is dedicated to the ideals, the dreams, and the hard facts that have created America...with the hope that it may be a source of joy and inspiration to all the world." Disneyland is a place where magic truly exists and where emotions can only range from joyful to completely elated because it is physically impossible to be sad when you are in those hallowed gates! My heart aches that I'm not currently flying high over London with Peter Pan, dueling swashbuckling pirates with Captain Jack, or enjoying one of the millions of other wondrous things to do in the park, but I can take comfort in the fact that my second season pass is currently in the mail and on its way to my house for when I am finally reunited with my beloved Disneyland in just 31 days! I have hundreds of pictures I could share of the incredibly amazing times I have had there, but in the interest of time, here are just a few. Sleeping Beauty's castle...yes, I took this picture and yes, it is amazing. Lyss, Lexi, Me, and Aubrie with the big man himself, Mr. Mickey Mouse! 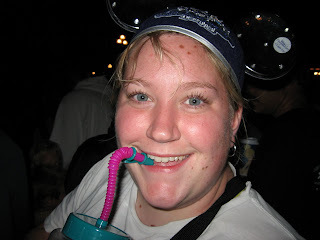 I realize I look OOC in this picture, but I had to post it to show how Disneyland makes you INSANELY happy! Thank you for the beloved post and the text message to remind me of the great beginning of the most magical place in the world!!! I am a little bummed that you didnt include a pic of me in you montage of disneyland trips:) oh well, next time..disneyworld??? Oh, Holly, I love you so! And I do share a love for Disneyland with you, although I must admit I think you love it much more than I do. I think we should go together someday....Quakisurpiniku!? !